This pretty little church in the pleasant suburbia of the Sprowston Road was built in the 1880s as a chapel of ease to Sprowston's elegant and beautiful medieval parish church of St Mary and St Margaret, right out on the very edge of the city. As is often the way with such things, it soon took on a life of its own and developed its own community, while continuing to work closely with the mother church. The architect was one ARG Fleming, who I am not aware of coming across elsewhere in Norfolk, and the church is a simple, aisleless hall church in red brick and timber, with a functional west front. 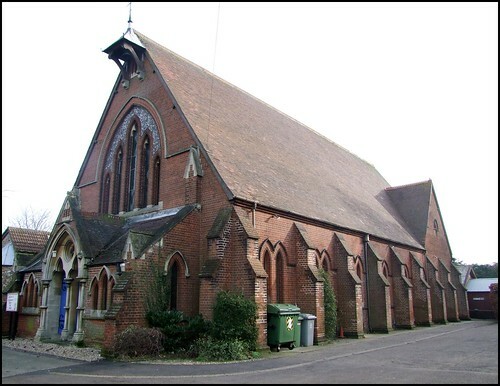 In the 1990s, an extension to the north containing meeting rooms and a kitchen was added, in exactly the same way as at St Mary Magdalen further into town. Most encouragingly for a suburban church, St Cuthbert is open for private prayer and to casual visitors every day, and as at St Mary Magdalen you enter the church through the extension. The interior of the church is a little like being inside a vast upturned boat, a pleasing reminder that the very word 'nave' comes from the same Latin root, navus, meaning a boat, as the words 'navy' and 'naval'. There is a sense of great space inside the church. Simply, it feels bigger than it is. The line of nave and chancel is unbroken, and there are no arcades to form aisles. The windows on both sides are quite low down, and the great roof lifts high above them. I was really pleased to meet the friendly churchwarden of St Cuthbert - he dropped by to turn the heating on for a drama group in the hall, and we soon got to chatting about the church. He obviously loved it dearly, and knew it inside out. It made such a great contrast with my unpleasant experience at St George nearer into town a short while earlier. He told me that there had been considerable alterations here in the early 1990s. Firstly, the entire east end of the interior was altered - the screens and vestries had been taken out, and the sanctuary reordered away from the east wall. A beautiful reredos depicting the imagery of St Cuthbert had been painted by local people. The woodwork from the screens and vestries had been used to build an elegant gallery at the west end of the church, and the organ, previously in the south-east corner, was now up in the gallery. Best of all, beneath it had been built a little chapel for private prayer; it opens opposite the entrance from the extension, "so people can come in off the street and have a little quiet time in the presence of the Lord", my new acquaintance said. This explained the simplicity and openness of the east end, flooded with light and a sense of the numinous. It was brilliantly done. As you have probably guessed, I really like this church a lot. And while St Cuthbert is obviously the beating heart of a living and breathing faith community, there were two ghosts of the past which also pleased me immensely. The first of these I would not have noticed if it had not been pointed out to me. The unaltered windows on the south side (those to the north form doors and openings into the new extension) retain the cast iron fittings for the Second World War blackout. They were never removed. Secondly, the fine medieval font here came from lost and lonely Kempstone, way out in the woods on the edge of the Breckland. The church there was abandoned finally in the 1960s, and because it is on private land the ruin is little known. But I had been there, and the contrast between that remote spot and this dear place was for a moment breathtaking; and then, as I thought about it, not so much a fracture as a thread down the years, and the font itself a touchstone to the long Norfolk generations.